As a member of the International Karma Kagyu Buddhist Organization (IKKBO), I feel the responsibility to clarify some of the points that had been published in various news articles in the past about the arrival of H.H. Ugyen Trinlay Dorje Karmapa in the United States in March 2008.These articles repeatedly referred to Ugyen Trinlay Dorje as the official Karmapa. The title Karmapa goes back 900 years in the Karma Kagyu lineage and represents the longest unbroken chain of reincarnated leaders among the four main schools of Tibetan Buddhism. Throughout the nine centuries, the majority of the previous sixteen Karmapas has been selected, or “recognized”, by the lineage’s second-in-command, the Shamarpa. Accordingly, the 16th Gyalwa Karmapa passed away in 1981 and in 1994, the current Shamarpa officially recognized Thrinlay Thaye Dorje, born in Lhasa, Tibet in May 1983, as the 17th Karmapa. Thrinlay Thaye Dorje’s calling to his high office has been affirmed by many spiritual leaders and monks from all Tibetan Schools. He travels widely, speaking to thousands of people around the world. faith and religious tradition as observed by the Karma Kagyu lineage, as secondary. But historically the recognition of Karmapa has never been based on majority votes, and which is why at the same time these Tibetans also believe Thrinlay Thaye Dorje to be Karmapa. The 16th Karmapa’s legal administrators and monks whole-heartedly accepted the recognition of Thrinlay Thaye Dorje as the traditional Karmapa. Ugyen Trinlay Dorje himself has recently adopted this view as well. Although he previously proclaimed himself the only Karmapa, possible misinterpretation could have existed in translation, for he has stated in recent meetings with Tibetan spiritual leaders and monks that he regards Thrinlay Thaye Dorje as Karmapa as well, because he was recognised by the Gyalwa Shamarpa. Being under the direct training of H.H. the Dalai Lama, Ugyen Trinlay Dorje Karmapa has always maintained a high level of dignity. When asked about what he thinks of the handful of people who has misused his name in the past to achieve their own purposes, such as collecting donations from foreign devotees to bribe politicians and police; taking over the Rumtek monastery by force from the administrators and monks of the 16th Karmapa; stealing the jewels of religious objects of the Rumtek monastery; and rewriting facts pertaining to lineage history etc., he responded that should the allegations be true, he would strongly condemn such people and such acts. For this the legal administration of the 16th Gyalwa Karmapa told Ugen Trinlay Dorje that they were ready to present evidence of the crimes to him should he be willing to form a special committee for the matter in 2006. Unfortunately, upon receiving the news, Situ Rinpoche has forcefully sabotaged the plan with the help of Druppon tulku, the general secretary of Ugyen Trinlay Dorje. Throughout Tibetan history, the reincarnations of the Karmapas have always been recognized by their own successors, the majority of which have been the Shamarpas. 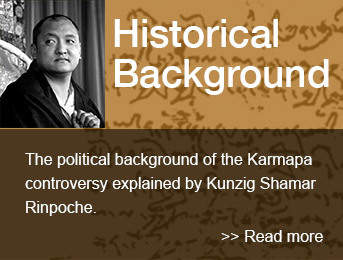 The previous Shamarpas were known as the “red hat” Karmapa. Even in The Political History of Tibet written by the finance minister of the Dalai Lama, it was also mentioned that the Shamarpa is the red hat Karmapa. Karmapa. The third account, or version of Ugyen Trinlay Dorje’s selection, was given by the Dalai Lama himself. He claimed that in 1992, after being informed by Situ Rimpoche that Ugyen Trinlay Dorje was his candidate, the Dalai Lama dreamt that he saw a valley very similar to the homeland of the young boy. The Dalai Lama took this as affirmation and on June 30th 1992 he officially recognized Ugyen Trinlay Dorje as the 17th Karmapa. For the head of one school to pick the head of another is unprecedented. administration of the 16th Gyalwa Karmapa. Neither has been nominated by the 16th Karmapa as a regent; in fact, in 1985 they were ordered by the 16 th Karmapa’s office to stop using this title. Yet these two Rinpoches were involved in the recognition of Ugyen Trinlay Dorje in China as well as the take-over of the Rumtek monastery, the seat of the 16th Karmapa, in 1993. A court in India has ruled the take- over to be illegal, after finding that Situ Rimpoche and Gyaltsap Rinpoche had bribed local politicians and police with funds provided by the Chinese Government initially. These two Rinpoches have betrayed India, thehost country where they take political asylum, and since these findings have been slapped with restrictions on their movements, both within and outside of the country. Despite these problems — and the fact that there has never been an instance in which the Dalai Lama has recognized a Karmapa — Shamar Rinpoche has been willing to co-operate with the Dalai Lama’s decision recognizing Ugyen Trinlay Dorje as Karmapa. Shamar Rimpoche has done this out of a desire to support a stable Tibetan government. In addition, the Shamarpa believes the competing claims do not, in fact, pose any contradiction because the Karmapa, as a great bodhisattva or spiritual being, can emanate in many forms to benefit all sentient beings according to their needs. To underscore his willingness to be supportive, Shamar Rinpoche even provided the necessary help for Ugyen Trinlay Dorje to obtain Indian government’s approval for his recent visit to the U.S., though at the same time maintaining the stance that Thrinlay Thaye Dorje is the traditional Karmapa. While this may be confusing to outsiders, it could be considered this way: Ugyen Trinlay Dorje is the new official Karmapa of the Chinese and Tibetan Governments, and Thrinlay Thaye Dorje is the official Karmapa according to the rightful spiritual leader Shamarpa, 16th’s Karmapa’s administration, and the 900 years old Karma Kagyu tradition. The truth is there has been a Karmapa controversy for the last fifteen years, and it would be a bold misinterpretation to say otherwise.